Do you have a Minecraft-obsessed kid in your house like I do? Actually, I have two of them. Well then perhaps you'll be delighted to hear that Microsoft has bought MinecraftEdu and is expanding it into a major resource for classrooms. It will be available as a free trial this coming summer. 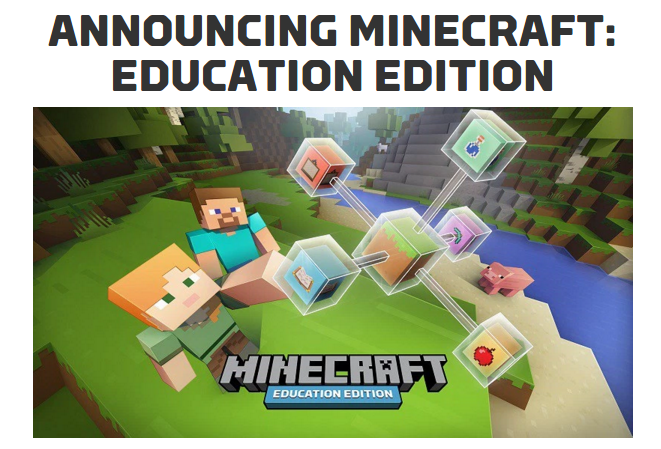 In the spirit of the Minecraft community, we are dedicated to making sure Minecraft: Education Edition is shaped in the coming months by a growing community of educators online at education.minecraft.net. We’re also excited to also share that these community pages will host a variety of resources like lesson plans and a new Minecraft Mentors page that allows educators experienced in Minecraft to connect with those interested in trying it for the first time. I have to admit that I've always had a bit of a love/hate relationship with Minecraft because it concerns me that my kids are so addicted to it. But at the same time, I love the concept behind the game. I originally thought of it as virtual LEGOs, but really, it is so much more than that. Anyway, I feel that if there is a way that I can use this program that my kids love so much in an educational manner to teach or reinforce concepts they are learning in school, then it is a win-win for everyone. Right there with you. :-) The key is to take their interest in being creators and problem solvers and build on it to bring them coding skills, etc. My two did this last summer with their own private Minecraft coding camp at home with Dad.Youth Digital is another product that teaches kids how to set up their own Minecraft servers, start animating, etc. As long as they love it, let's keep them learning... Perhaps we're creating the next gen computer scientists or animation geniuses. Best thing? My daughter is AS INTO IT as my son... Or is it vice versa? Ha! Yes. It is the same in my house. I am absolutely amazed at their creativity and their virtual building skills.